Over 1,000 people lined the walkways outside the Capitol this afternoon in a silent protest against several pieces of legislation making their way through the General Assembly that would strip women of reproductive rights. Over 1,000 demonstrators assembled outside of Virginia’s Capitol this afternoon to protest several pieces of legislation currently working through the state legislature. Amid melting snow and extra police, demonstrators lined the walkways for Speak Loudly with Silence, a silent protest. “Things are really scary,” said Erin Reichhardt, one of the many demonstrators that took part in this afternoon’s event. “Things are being passed I’d never thought would be passed.” She said that recent bills have made her politically active for the first time in her young-adult life. 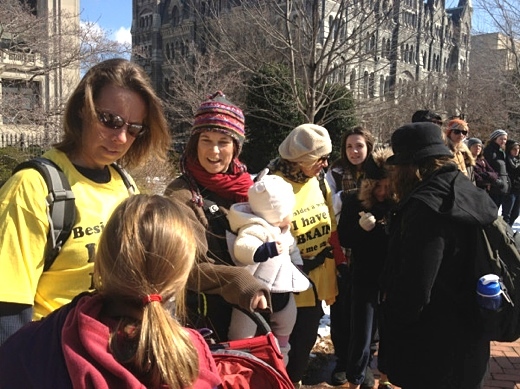 The protest event outside of the Capitol lasted from 11am – 12:30pm, at which point attendees were encouraged to walk into the General Assembly building (still open despite the Presidents Day holiday) to speak with their representatives and dissuade them from supporting the proposed bills. At 2pm, a rally was planned at the Bell Tower. “No one likes abortion,” continued Burtner, who said that education and contraception are the best ways to lower the abortion rate. She referenced a Christopher Newport University/Richmond Times-Dispatch poll that found that 55% of registered Virginia voters opposed the ultrasound requirement before an abortion, saying “this is not what the people want.” She also pointed out the legislation was recently parodied nationally on Saturday Night Live. For the second day in a row, the House of Delegates has deferred action on a bill that would require women to undergo a medically unnecessary ultrasound before having an abortion. The chamber is scheduled to vote on the measure tomorrow. A reason for the delay in voting was not immediately given. Perhaps relatedly, U.S. House Majority Leader Eric Cantor (R-VA, 7th District) was in Richmond today and met with the Majority Leader in the state House, Kirk Cox, to discuss unknown matters.